Cecropian moth caterpillar are out and about. Will the real green giant please stand up? Polly Hill Arboretum staff report that a sizeable green monster has taken up residence in their parking lot. 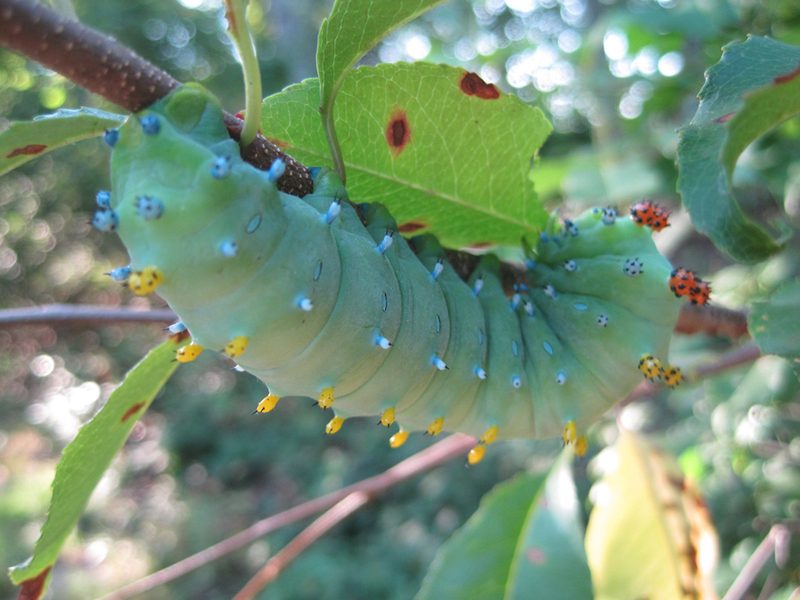 A cecropia moth caterpillar has been wowing arboretum visitors all week with its grand green proportions. It may not be too hard to differentiate the giant green cecropia caterpillar from the jolly green vegetable-advertising icon, but actually they do share some interesting similarities. Giant says it all. Cecropia moth caterpillars have impressive dimensions: This caterpillar can be four inches long with a girth of ¾ of an inch, and its cocoon is even a bit larger! The jolly green giant, on the other hand, towers over both us and the moth at 55 feet high, if the statue of him in Blue Earth, Minnesota, is accurate. The jolly green giant has always been only one color, but the cecropia moth caterpillar was black when it first hatched from its egg. As the caterpillar goes though its four growth stages, or instars, it will change color from black to yellow-orange and lastly to its final green color before it wraps itself in a large silk cocoon to overwinter. Even more intriguing are the blue, orange, yellow and red knobs or tubercules with black spikes that protrude all over its body. You should be able to easily spot it on its favored foods, which include birch, poplar, alder, elm, maple and fruit trees. Both of these lean, green eating machines have achieved their own kinds of fame. The jolly green giant is a household name, gracing pantries and refrigerators nationwide; he gained his notoriety in a short time. The first green giants were unusually large peas, marketed under the green giant moniker. The jolly man came later, in 1928, when he began to appear in advertisements for these robust peas. Cercropia moths have been around for a much longer time, and have achieved their recognition by wiggling their way into the record books. They are the largest moth in North America, with a wingspan of up to seven inches! And they also could win a beauty contest. Their hefty red-brown wings are adorned with large eyespots, stripes and crescent-shaped designs. Who said that moths were plain-Janes? This not-at-all-plain-Jane will easily be found by her Tarzan. Female cecropia moths emit strong pheromones that are sensed by the large, plumous antennae of the male. Research has shown that males can find females by their released pheromones even if they are more than four miles apart. Mating is just the beginning; the entire life cycle of the cecropia takes some time. In fact, it takes one full year for the transformation from egg to caterpillar to moth to be complete. Animals such as this, which only have one brood per year, are known as univotine. Now is the time to see the caterpillars and, for a short time, the moths, which only live for a few days to a few weeks. And in its short time as a moth, eating is not on the agenda, just mating. Like luna moths, cecropias do not have mouths, so not only can’t they eat, but they have to have some advance planning built into their life-cycle: The caterpillars weave a one-way exit in their cocoon so that they can get out when they transform into a mouth-free moth. So, no little green sprouts or niblets for them when they emerge from their cocoon. And no jaunty red scarf, either. Yet in the world of insects, backyards, and even arboretum parking lots, they are still the big players on the block and certainly of gigantic interest. Suzan Bellincampi is director of the Felix Neck Wildlife Sanctuary in Edgartown.